Benchmarks of an Intel “Kaby Lake” processor have supposedly leaked revealing what’s presumed to be the upcoming Core i7-7700K. The benchmarks stem from SiSoft benchmark results posted online that reveal an Intel CPU with a base clock speed of 3.6GHz and a turbo clock speed of 4.2GHz. The chip also has 8MB of L3 cache, eight threads, and integrated graphics clocked at 1,150MHz, along with 24 execution units. The benchmarks ran on March 29 using a 64-bit Windows 10 system. According to the software’s arithmetic benchmark, the processor is capable of 118.71 GOPS (giga-operations per second) across eight threads. Meanwhile, on the multimedia processing front, the chip can handle 313.84 megapixels per second, whereas it can manage 35.3 GOPS in the Microsoft .Net arithmetic benchmark. Moving down the line, the benchmarks show a performance of 5.59GB per second during cryptographic processing, a DDR4 latency of 23.2 nanoseconds, and a GPU performance of 37.41 megapixels per second. Unfortunately, the benchmarks may not be a good indication of final performance. 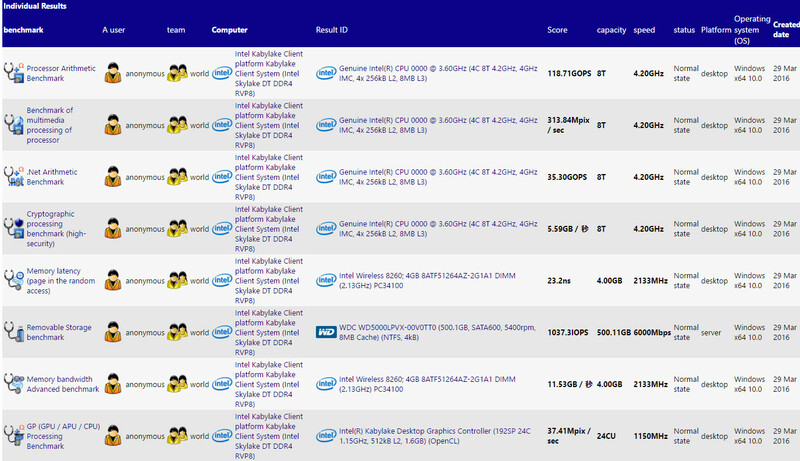 The numbers are generally below those of the current Core i7-6700K. It’s hard to say why Intel’s follow-up would be slower. What the numbers do tell us, though, is that Kaby Lake silicon is up and capable of running everyday apps, so it’s likely nearing release. Keep in mind that the leaked benchmarks do not specifically list the Intel Core i7-7700K processor, but rather an “Intel Kabylake platform Kabylake Client System” with a “Genuine Intel CPU 0000.” However, previous leaked specs match the benchmark details that also show this processor will be based on 14 nanometer process technology, come packed with four cores (eight threads), and ship unlocked to the delight of overclockers around the world. The upcoming Core i7-7700K will be the successor to the Intel Core i7-6700K “Skylake” processor released last year. It is expected to serve as Intel’s flagship unlocked processor until sometime next year when the company launches its 10 nanometer “Cannonlake” processors. It will be joined by the Core i7-7500U “Kaby Lake-U” chip, and the Core M7-7Y75 “Kaby Lake-Y” chip, which targets ultra-low power platforms like slim ultrabooks. The new Kaby Lake processors are expected to be officially revealed during Computex 2016 in June followed by a commercial release in Q3 2016. Overall, this family will have a thermal envelope between 35 watts and 95 watts, support for DDR4 and DDR3L memory, and support for socket LGA 1151. That means they will be compatible with current Z170 motherboards as well as Intel’s upcoming 200-series chipset based on LGA 1151. Computex takes place in Taipei between May 31 and June 4, so we expect to see the full official details then.